The case of Flyers’ Rights v. FAA caught my eye today, as I am a tall person who is ever-aware of the shrinking amount of leg room on airline flights. In Flyers’ Rights, the appellant appealed to the D.C. Circuit after the FAA denied Flyers’ Rights petition for a rulemaking by the FAA. The proposed rulemaking had to do with the minimum amount of leg room that should be provided on a flight. That got me to wondering whether the USPTO ever receives any proposed petitions for rulemaking and what some good new rules might be. For example, if the vast majority of requests for amendments in IPR proceedings are being denied by the PTAB, should an industry group petition for a rulemaking to correct that situation? The section 101 analysis applied by the PTAB was not legally erroneous under Mayo and Alice. And its underlying fact findings and credibility determinations are supported by substantial evidence in the record. and thus implies that the USPTO’s §101 determinations are based on underlying factual findings (e.g., whether a claim as a whole recites well-understood, routine, and conventional activities), should an industry group petition for a rulemaking that a USPTO rejection of a claim under §101 must provide evidence that the proposed claim recites well-understood, routine, and conventional activities? The D.C. Circuit’s opinion in Flyers’ Rights v. FAA is available [here]. The oral argument in Flyers’ Rights v. FAA is available [here]. But that is not how judicial review works. We cannot affirm the sufficiency of what we cannot see. “[A]n agency decision based on ‘reliable data reposing in the [agency’s] files’” but hidden from judicial view “simply cannot withstand scrutiny.” United States Lines, Inc. v. Federal Maritime Comm’n, 584 F.2d 519, 535 (D.C. Cir. 1978). Indeed, we have long held that, when “the data relied on by [an agency] in reaching its decision is not included in the administrative record and is not disclosed to the court[,]” we cannot “determine whether the final agency decision reflects the rational outcome of the agency’s consideration of all relevant factors[. ]” United States Lines, 584 F.2d at 533 (footnote omitted). Whatever deference we generally accord to administrative agencies, “we will not defer to a declaration of fact that is ‘capable of exact proof’ but is unsupported by any evidence.” McDonnell Douglas Corp. v. United States Dep’t of the Air Force, 375 F.3d 1182, 1190 n.4 (D.C. Cir. 2004) (citation omitted). Flyers’ Rights v. FAA, No. 16-1011 (D.C. Cir. July 28, 2017) at page 13. Query: If the Director of the USPTO utilizes panel stacking to implement new USPTO procedure in place of notice and comment rulemaking, has the Director disclosed all the data relied on in reaching its decision? For more on petitions for rulemaking under the APA see: [link]. Those of you who like to follow the development of the legal theory of “judicial taking of property,” since that theory was discussed in the plurality opinion in Stop the Beach Ren. v. Fla. Dept. of Env. Prot., 130 S. Ct. 2592, 560 U.S. 702, 177 L. Ed. 2d 184 (2010) will be interested in yesterday’s decision in Petro-Hunt, L.L.C. v. United States [Link]. This appears to be only the fourth time that the Federal Circuit has addressed the “judicial taking of property” cause of action since Stop the Beach issued. Stop the Beach Renourishment, Inc. v. Florida Department of Environmental Protection, ___ U.S. ___, 130 S.Ct. 2592, 2602 (2010). The oral argument of the day is from INTEGRATED CLAIMS SYSTEMS, LLC v. TRAVELERS LLOYDS OF TEXAS INSURANCE COMPANY, No. 2016-2163 (Fed. Cir. Apr. 11, 2017). The oral argument primarily concerns application of the court’s SECURE AXCESS, LLC, v. PNC BANK NAT. ASSOCIATION decision from earlier this year with respect to how to determine whether a patent is subject to covered business method (CBM) review. You can study the court’s Rule 36 Judgment [here]. The Federal Circuit’s en banc decision in In re Aqua Products should be out soon. Aqua challenges the Patent Trial and Appeal Board’s amendment procedures, which require the patentee to demonstrate that amended claims would be patentable over art of record. Totally off-track, not particularly pertinent to this case, and not from this case; but, this is one of my favorite sound bites from Judge Dyk about interpreting regulations based on public statements: [Listen]. Those of you who like to try to read the tea leaves of other oral arguments in order to predict how the court is leaning in an en banc appeal might be interested in the oral argument of ZAGG INTELLECTUAL PROPERTY HOLDING CO., INC. v. TECH 21 UK LTD., No. 2016-1976 (Fed. Cir. Apr. 11, 2017). That oral argument is available [here]. Oral Argument of the day: INTELLECTUAL VENTURES II LLC v. ERICSSON INC. The oral argument of the day comes from INTELLECTUAL VENTURES II LLC v. ERICSSON INC., No. 2016-1803 (Fed. Cir. Apr. 18, 2017). This case is primarily an obviousness case. The Board also instituted review of claims 1 and 2 based on a combination of six references, and later determined that the six-reference combination also rendered claims 1 and 2 unpatentable as obvious. Final Decision, 2016 WL 380219, at *11-12. Because we affirm the Board’s conclusion based on the combination of Li, Yamaura, Zhaung, and Beta, we need not, and do not, reach the second combination. That footnote is given more context by these comments during oral argument from Judge Reyna, who was concerned with possible hindsight being applied by the PTAB when a large number of pieces from different references are combined together* [Listen] and [Listen]. To listen to similar comments by other Federal Circuit judges in other oral arguments, visit this [post]. You can read the court’s opinion [here]. *Sometimes referred to as a Frankenstein’s Monster rejection. The oral argument at the U.S. Court of Appeals for the Ninth Circuit in the Naruto v. Slater case is scheduled for July 12th in San Francisco. [Notice]. I will post the video of the oral argument once it is available. 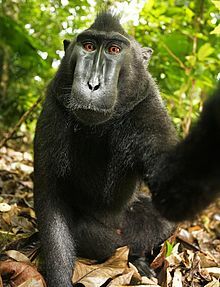 This case concerns whether a monkey — more specifically, a Crested Macaque — that used a photographer’s camera to take a selfie portrait can be considered an “author” under the Copyright Act. The briefs are available [here]. For more on the background of the case, this is the link to the Wikipedia entry: [Link]. By the way, in the unique town of Boulder, CO a city regulation requires all public signage to refer to dog “guardians” rather than dog “owners.” [Link]. You are currently browsing the 717 Madison Place blog archives for July, 2017.